Quite the weekend I had myself. Highlights were many. I had myself my own mini vacation. I packed a bag and left on my own or Logan. A race planned as well as a writer's conference with the League of Utah Writers. Inspiration was abundant and plenty. I met Mr. Rudy Ruettiger. THE Rudy. Can you believe he is as tall as me? Can you believe this guy took hits from those big Notre Dame guys? He was incredible to listen to and I was even more impressed with him when I found out his movie was made by his own accord. It took him 8 years, EIGHT YEARS to get his movie to someone who wanted to make it. This guy has been a fighter and self-made man his entire life. He truly is the salt of the earth too. I was inspired, impressed, and in awe of all he's accomplished. His message is simple. Go after your dreams and don't let anyone tell you how to do it either. Don't let "goofy thoughts" stop you from achieving everything you've ever wanted to. So that was Mr. Ruettiger. I kind of wish he was my next door neighbor. His very presence oozes positivity and finding joy in your successes. My weekend also consisted of missing my darlings. I missed them terribly. But their daddy is their favorite person, so they were just fine. Uh, more duct tape, you ask? Yes. 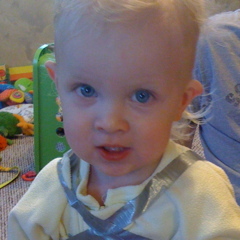 This dextrous darling LOVES the challenge of the button and zipper of her pjs. Of course she doesn't do it back up and we don't want her to be cold. 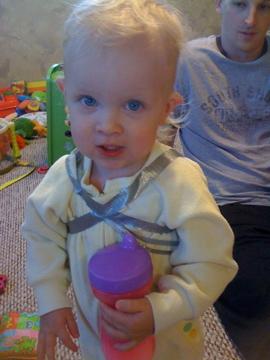 Ergo, she looks like some kind of duct tape warrior princess. My second marathon. It was such a different race than my last one, for a lot of reasons. It rained, it hailed, I felt incredibly unprepared. Kind of strange to beat my last time by an hour and half, but there were reasons for that. 4:32:28 is the official time on the books. Two runners and a cheerleader! 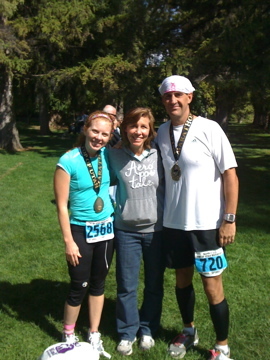 I missed Stephanie running with me this race, but it was great to see her happy face at the finish line. Congrats to Steve for a sub 4:00 marathon. That's what I'm calling it. The course was .3 miles longer than a marathon and he ran it in 4:01. Biggest pet peeve of mine is when the course is longer than advertised! So that is a quick and dirty sum up of my lovely weekend. Time with old friends, reconnected with new, inspired by many, rained on and slept in. I'm a lucky gal. i'm happy that i DIDN'T EVEN KNOW YOU WERE RUNNING A MARATHON THIS WEEKEND! sheesh. what am i? chopped liver? we really need to communicate more. congrats! glad you had a great weekend/vacation! sunny's outfit is AWESOME. 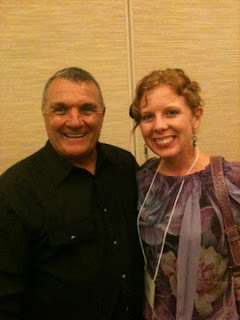 You met RUDY!!!! That is truly incredible. To this day, Rudy is one of my favorite movies. So cool. Your marathon! That too was just amazing. Great time, especially given the weather conditions. I think you yourself have a champion heart. But there has been evidence of that for like the last 30+ years. You should be proud Sunny has such great dexterity. And she looks great as a duct taped warrior princess. Maybe you should rethink your Halloween costume. Love you!